Apple has confirmed that it will hold an event on October 4 at 10am PST. Word of the event comes in the form of an invitation sent out to select media organizations. 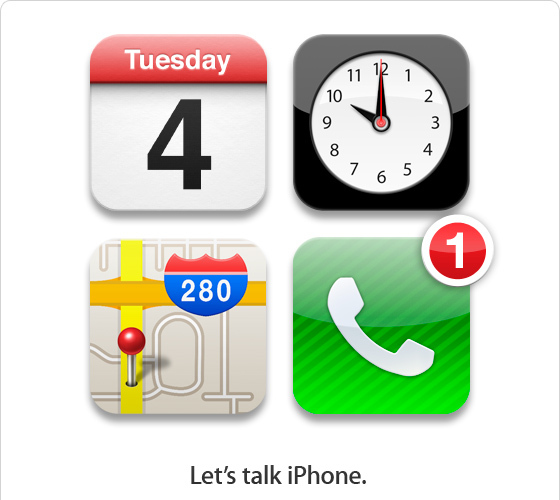 The tagline on the invitation: “Let’s talk iPhone.” In other words, the iPhone 5 – and possibly the iPhone 4S – is coming very soon. As expected, the event will take place at its headquarters in Cupertino, California, rather than the traditional iPhone event venue, the Yerba Buena Center for the Arts (YBCA) in nearby San Francisco. Apple’s new CEO, Tim Cook, is expected to deliver the keynote address. If so, it will mark the first time anyone other than Steve Jobs, who recently resigned from his post as chief executive, reveals the new iPhone to the world. The reason for choosing the smaller theater at Apple headquarters over YBCA for this year’s iPhone event is unclear, though some believe it may be because of a 4G LTE presentation the company has in store. Whether or not the next iPhone will support 4G connectivity has remained one of the vaguest of rumors. It’s been 15 months since Apple released the iPhone 4 – much longer than the company normally takes to launch its newest device. According to the over-saturated rumor mill, Apple will release two new devices this year. The first, a less-expensive model, often called the iPhone 4S, is said to look nearly identical the iPhone 4, with a few internal improvements. The device may sell for around $300, and come without a predesignated carrier. The second device, most commonly called the iPhone 5, will reportedly be a completely re-imagined Apple handset, with a tapered “tear drop” profile, a larger edge-to-edge screen, a dual-core A5 processor and an 8-megapixel camera. The iPhone 5 is also expected to support both GSM and CDMA wireless signals. While the two-iPhone rumor has been around for months, the invitation makes us think that the company will only unveil one device. If you look at the icons, each has its own meaning. The calendar shows the event date; the clock shows the time; the map, the location. And the phone icon — well, there’s a big number “1” right there. If that’s not an Apple-style hint, we don’t know what is. So that’s it, the wait is nearly over – and the endless stream of iPhone 5 rumors will soon, mercifully, dry up to be replaced with cold, hard facts.